In Oaxaca alone, the Ministry of Economy has issued 322 mineral rights concessions to extract silver, gold, copper, and zinc, among other minerals. In doing so, it has violated the right to previous and informed consultation not only of the Chontal region, but of all peoples in Oaxaca. 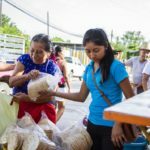 At least 16 Chontal communities in the Oaxacan Isthmus that could be affected by mineral exploitation have decided to, by judicial means, impede and prohibit extraction in their territory. 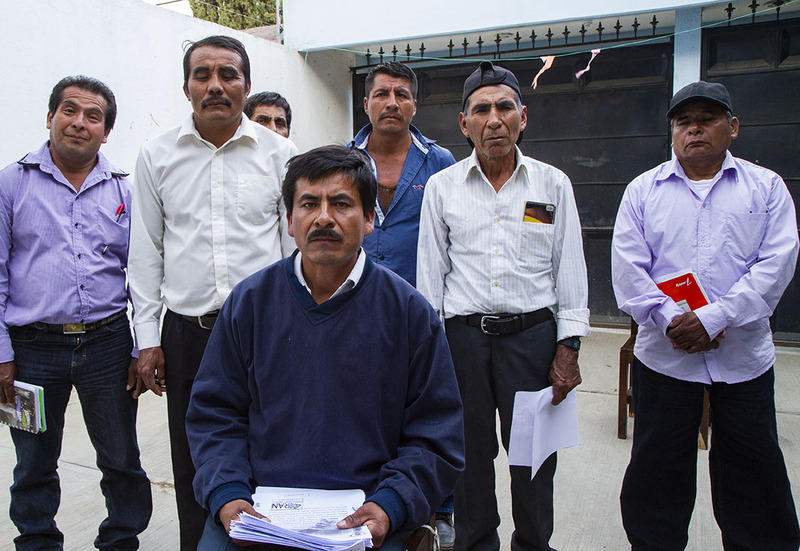 The indigenous community of Santa María Zapotitlán, part of the municipality of Santa María Ecatepec, Oaxaca, filed writ of amparoi #1208/2018 against mining concession #238447 and the Mining Law. This mining concession belongs to Minera Zalamera S.A. de C.V., a company in Canadian hands. The motion was filed in the Fourth District Court in the state of Oaxaca. In doing so, the communities have sued 18 federal and state authorities for granting the mineral concession—valid for 50 years—to Zalamera S.A. de C.V., a subsidiary of the Canadian company Minaurum Gold Inc., which seeks to extract gold, silver, copper, zinc, and lead. 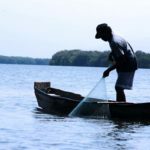 Through this legal recourse, the communities have denounced two things: “the unconstitutionality of the Mining Law and the granting of this concession, which is in violation of several rights,” stated Armando de la Cruz Cortez, a Chontal lawyer. 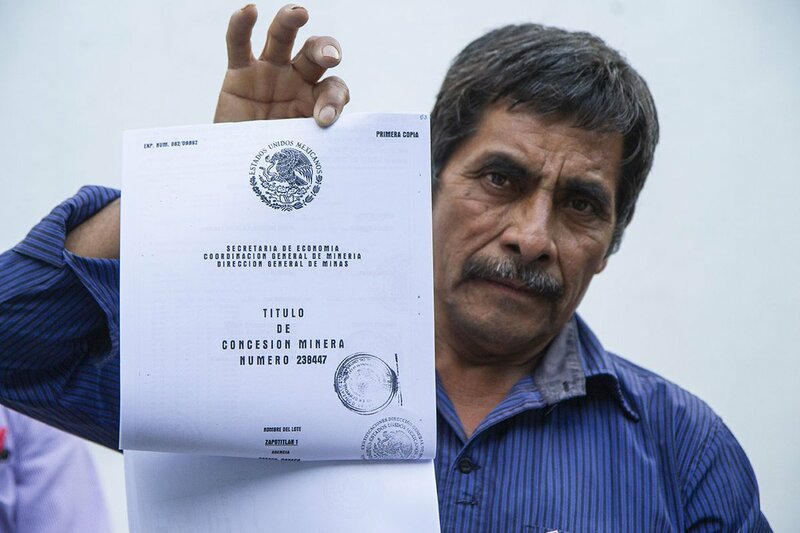 Cruz, who is also a coordinator of the NGO Tequio Jurídico, mentioned that the lawsuit also targets the federal government because “the concession was granted by the Ministry of Economy, but it has its basis in the Mining Law.” By arguing that resources below the subsoil fall under federal jurisdiction, this law “grants concessions without the authorization of any community authority, and is therefore an act of imposed authority that ignores rights, including international rights, such as the right to consultation,” said the lawyer. Among those being sued are: the Chamber of Deputiesii and the Senate, the President of Mexico through the Ministry of Economy, the Secretary of Governance, the director of the Official Journal of the Federation, the Secretary of Economy, the General Mining Coordinator of the Ministry of Economy, and the head of the Ministry of Economy’s Oaxaca branch, among others. “Within these 18 authorities is a portion of the mining sector at the federal level, with the Ministry of Economy and its state representatives at the head. 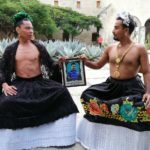 The entire mining sector of Oaxaca has also been sued,” added the lawyer. 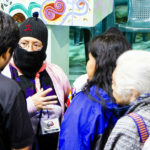 The suit was brought on December 18, 2018 by the indigenous community of Santa María Zapotitlán, which is part of the Chontal People’s Assembly for the Defense of our Territory (Asamblea del Pueblo Chontal para la Defensa de Nuestro Territorio, APCHDT). Two days later, the Fourth District Court granted a “complete suspension.” “This suspension is a preventative measure, but moreover it’s a measure that we consider important. By declaring the complete suspension, the judge has ordered all of the authorities named as responsible to leave things in the state in which they find them. That is to say, they are not to carry out actions that could deprive the plaintiff communities of their property or the possession and use of their agrarian rights—neither partially nor totally, temporarily nor permanently,” said Cruz. Article 129 states that, among other examples, the following are considered to be instances of harm to public interest or violations of public order regulations: “XIII. Impeding or obstructing the State in the utilization, leverage, or exploitation of the resources over which it has direct dominion, referenced in Article 27 of the Political Constitution of the United Mexican States.” These are the articles the Ministry of Economy is using to appeal for the suspension to be overturned. “They objected because they think that the suspension affects their rights. First, they’re saying that this suspension is damaging to the public interest and they’re centering this on the Ministry of Economy’s authority to exploit mineral resources by means of its mining concessions. Second, they argue that it’s infringing on a law that has to do with public order—they’re referring to the Mining Law,” stated Cruz. The company, which in this case is the affected party, “had to be notified as well, and was supposed to have issued a report, but up to this moment there has still been nothing from them,” he adds. Cruz condemned the fact that the representative of the Ministry of Economy “is handling not only the defense of the President of the Republic but that of everyone from the Ministry of Economy. But what worries us most is that she’s also acting as the voice of the company. It’s worrying that this “Fourth Transformationiii” government has sent us this message—so concretely in this case—when at the same time they say they’re looking out for human rights and indigenous peoples in defense of their territory. They’re contradicting themselves,” said the plaintiff communities’ counsel. Cirino Martínez Flores, a Chontal man, doesn’t know much about laws, but along with other campesinos, he was chosen to help with territorial defense by Zapotitlán’s community assembly. He tells of how his pueblo decided to organize itself when one of the traditional authorities realized that the mineral rights of this territory had been conceded. “I stand together with the Common Lands Commission to confront this mine,” Martínez said with conviction. He is one of the spokespeople of the group of 16 communities from the Chontal People’s Assembly for the Defense of our Territory (APCHDT). As is the case with the majority of villages where this type of license has been issued, the indigenous people of this region received no information, much less any consultation about this concession. “In 2011, [representatives of the mining company] went to the Common Lands Commission and only said that they wanted to do some soil studies; they never said it was for a mine. After they conducted many studies, we became concerned and asked our uses and customs authorities to investigate. That’s when we found out about this concession to the Zalamera company,” said Martínez. 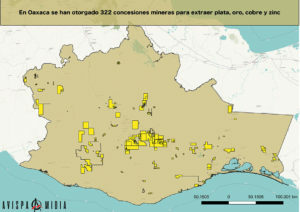 Minera Zalamera S.A. de C.V. holds seven mineral concessions in Oaxaca’s Isthmus region alone, principally for the exploitation of gold, silver, copper, and zinc. In addition to Zapotitlán, there is Jackita in Santo Domingo Zanatepec, San José in the municipality of Ayala, Aurena in Santo Domingo Tehuantepec, Riqueza Marina 1 and 2 in Santo Domingo Tehuantepec, and Riqueza Marina 3 en Santa María Mixtequilla. 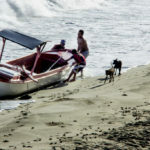 None of these municipalities were consulted prior to the issuance of these concessions, much less neighboring communities, which would also be affected. There are other companies that also hold concessions. “In this Isthmus and Chontal region, we’re talking about more than 60 concessions,” stated Tequio Jurídico’s lawyer. Oaxaca is a majority indigenous state. Of the 56 indigenous peoples recognized in Mexico, 16 are found here, with their own forms of government. Around 78% of land in Oaxaca, or 7,359,680 hectares, is collective property in the hands of native peoples. In Oaxaca alone, the Ministry of Economy has issued 322 mineral rights concessions to extract silver, gold, copper, and zinc, among other minerals. In doing so, it has violated the right to previous and informed consultation not only of the Chontal region, but of all peoples in Oaxaca. “We haven’t heard of a single one of these concessions being permitted or authorized by the pueblos, and they haven’t been informed of potential dangers. Therefore, we think this action is an attack against the constitution itself as well as the international human rights framework, like [convention] 169 of the International Labor Organization, with regard to indigenous rights and culture. 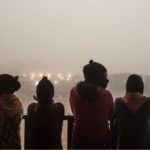 And in the rest of the country, this is the common denominator, because concessions have been imposed that violate the fundamental rights of native peoples,” argued the lawyer. 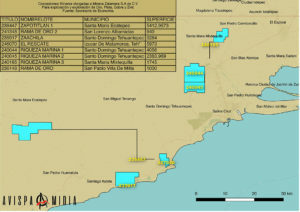 Some ten transnational corporations are behind the majority of mining concessions in Mexico, including Minaurum Gold Inc., Zalamera’s parent company. This transnational is headed by an experienced exploration and administration team “who has been credited for the discovery of more than 200 million ounces of silver and eight million ounces of gold in Mexico,” according to the company’s 2018 official report. Their official website shows 12 mining concessions, distributed among Oaxaca, Puebla, Guerrero, and Morelos. One of them is in the Gold Belt of Guerrero, which in recent years has been one of the main gold producing states. 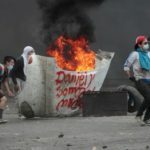 In contrast, this state is also one of the poorest in Mexico, with a high level of violence and social fragmentation. Before Andrés Manuel López Obrador took office as the President of Mexico, he announced the creation of a mining fund through Graciela Márquez, an official in the Ministry of Economy. Through it, the taxes paid by mining companies would be used to compensate for the damages they caused. This fund was created with 2013’s fiscal reform, during Enrique Peña Nieto’s presidency. Mines are charged a special tax of 7.5% of their profits, which goes to the “development” of communities close to mineral extraction. This fund is currently controlled by the Ministry of Economy. The Chontal people know what the Mining Fund goes to and they don’t agree with what is being proposed. “We know that this program to compensate people and villages affected by mining has been around since before the current government. But it’s a strategy that reinforces land dispossession, because these resources are not going to satisfy the many needs of communities. What’s more, this resource isn’t going to compensate for even a fraction of what a company like this will leave,” stated Cruz. The Chontals have also not been seduced by the prospects of so-called community development proposed to them by several successive governments. “For us as campesinos, development is in our lands, our community, because it’s our mother Earth and that’s where we work, that’s where we live. For us, that’s where development is, and we’re not interested in what the government thinks is best for us. Because without anyone telling us, we can see: if this mine goes through, what’s going to happen to our children and grandchildren? They’re going to wipe us out as the Chontal people. We’re the ones who are going to be the hardest hit,” declared Martínez Flores. At the entrance to Zapotitlán, there’s a guardhouse that is manned so as not to let any strangers into the community. “We’re well organized; we’re in resistance. We keep an eye on our authorities to make sure there are no negotiations with the government, because the highest authority is the Community Assembly and anyone who sells themselves out will be expelled from the community. Today we have decided to fight by legal means, and we are ready for whatever it takes to defend our territory. We’re not going to let this company in, and there is nothing to negotiate. This is already an agreement of our 16 communities that are fighting together,” added Martínez Flores. 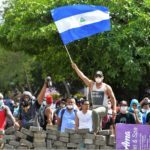 Whether or not these pueblos win this amparo, this action is a “tool that other pueblos will be able to use to defend their territory, and what we hope is that other pueblos will organize themselves,” stated Cruz. Update: The 13th Circuit Collegiate Court for administrative and labor matters ruled in favor of the community. It declared the authorities’ arguments—complaints about effects on “the social interest”—to be baseless. As such, the suspension remains valid until the amparo is definitively resolved. The community members have to go to court for a process hearing on April 3.